Nucleoplasmin 2 (npm2) is an essential maternal-effect gene that mediates early embryonic events through its function as a histone chaperone that remodels chromatin. Recently, two npm2 (npm2a and npm2b) genes have been annotated in zebrafish. Thus, we examined the evolution of npm2a and npm2b in a variety of vertebrates, their potential phylogenetic relationships, and their biological functions using knockout models via the CRISPR/cas9 system. 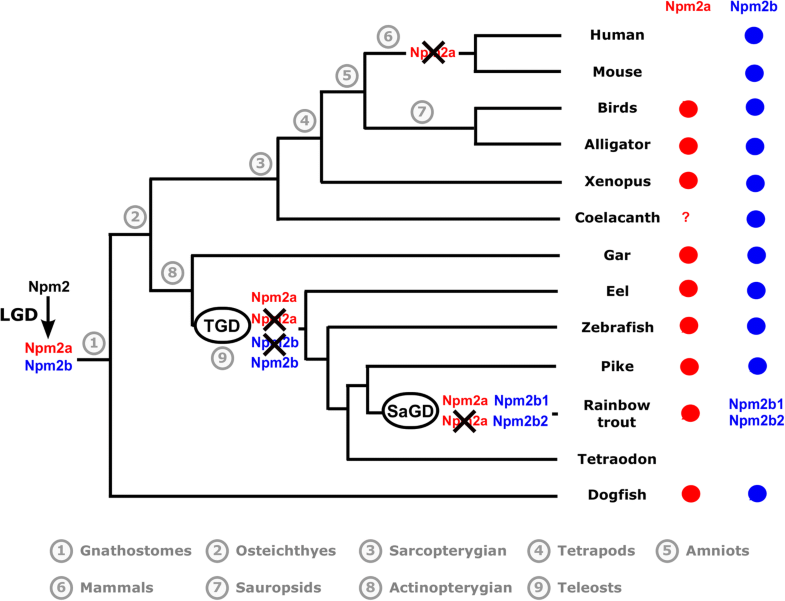 We demonstrated that the two npm2 duplicates exist in a wide range of vertebrates, including sharks, ray-finned fish, amphibians, and sauropsids, while npm2a was lost in coelacanth and mammals, as well as some specific teleost lineages. Using phylogeny and synteny analyses, we traced their origins to the early stages of vertebrate evolution. Our findings suggested that npm2a and npm2b resulted from an ancient local gene duplication, and their functions diverged although key protein domains were conserved. We then investigated their functions by examining their tissue distribution in a wide variety of species and found that they shared ovarian-specific expression, a key feature of maternal-effect genes. We also demonstrated that both npm2a and npm2b are maternally-inherited transcripts in vertebrates, and that they play essential, but distinct, roles in early embryogenesis using zebrafish knockout models. Both npm2a and npm2b function early during oogenesis and may play a role in cortical granule function that impact egg activation and fertilization, while npm2b is also involved in early embryogenesis. These novel findings will broaden our knowledge on the evolutionary history of maternal-effect genes and underlying mechanisms that contribute to vertebrate reproductive success. In addition, our results demonstrate the existence of a newly described maternal-effect gene, npm2a, that contributes to egg competence, an area that still requires further comprehension. In animals and plants, early embryonic development relies strictly on maternal products until maternal-to-zygotic transition (MZT) during which zygotic genome activation (ZGA) occurs . Maternal-effect genes are those that are transcribed from the maternal genome and whose products, which include transcripts, proteins, and other biomolecules, are deposited into the oocytes during their production in order to coordinate embryonic development before ZGA . MZT is a key step that is needed firstly for clearance of maternal components, and secondly to activate zygotic gene expression and to allow subsequent embryonic development. Among the maternally-inherited transcripts that play important roles during early development, some were demonstrated to regulate zygotic program activation such as nanog, pou5f1, soxb1 and microRNAs in zebrafish (Danio rerio) [3, 4]. Henceforth, all gene and protein nomenclature written in this manuscript will be based on that of zebrafish regardless of species for simplification purposes. Another gene, nucleoplasmin 2 (npm2), belongs to the family of nucleoplasmins/nucleophosmins that was demonstrated in zebrafish to be maternally-inherited at both protein and mRNA levels, whereby both play important roles in early development . Historically, this protein was identified and defined as a nuclear chaperone in Xenopus [6, 7]. While the protein has been shown to be the most abundant nuclear protein in the Xenopus oocyte  and to play a crucial role at fertilization due to its role in sperm chromatin decondensation [9, 10], its maternally-inherited mRNA has been recently demonstrated to be translated as a de novo synthesized protein that could play a crucial role during ZGA in zebrafish . Further, npm2 is one of the first identified maternal-effect genes in mouse whereby its deficiency results in developmental defects and eventual embryonic mortality . The npm2 gene belongs to the npm gene family that encompasses four members, npm1, npm2, npm3, and npm4. The evolution of the Npm family has been shown to result from the two rounds of whole genome duplication (WGD) that occurred in early vertebrates (vertebrate genome duplication 1 and 2, or VGD1 & VGD2, respectively) [12, 13]. Former evolutionary studies clearly provided a phylogenic model of this family; VGD1 produced two genes, npm3/2 and npm4/1, from an ancestral npm gene and the following WGD, VGD2, further created the current four npm types with subsequent loss of npm4 from mammals, but retained in most fish species [14–17]. Recently, two npm2 genes were automatically annotated in the zebrafish genome, i.e. npm2a (ENSDARG00000076391) and npm2b (previously known as npm2, ENSDARG00000053963). As the teleost ancestor experienced an extra WGD event (TGD, or teleost-specific genome duplication) , doubling of genes and other types of genomic rearrangement may be present in teleost species compared with other vertebrates. Moreover, a fourth round of duplication occurred more recently in salmonids (salmonid-specific genome duplication or SaGD) [19, 20], leading to further possible doubling of genes and other genomic rearrangements. Multiple evolutionary events (impact of TGD, local duplication, etc.) could have led to the evolution of npm2a/npm2b in zebrafish, which in turn may have significant impact on vertebrate reproduction. Thus, we investigated the evolution, phylogenetic relationship, as well as biological functions of npm2a and npm2b in a wide range of vertebrate species to broaden our knowledge on the evolution of maternal-effect genes and the underlying mechanisms that contribute to reproductive success in vertebrates. The following genomic data were extracted and investigated from the ENSEMBL genomic database (http://www.ensembl.org/index.html): human, Homo sapiens; mouse, Mus musculus; chicken, Gallus gallus; Xenopus, Xenopus tropicalis; coelacanth, Latimeria chalumnae; spotted gar, Lepisosteus oculatus; zebrafish, Danio rerio; and tetraodon, Tetraodon nigroviridis. The Chinese alligator (Alligator sinensis) genome was extracted and investigated from the NCBI genomic database (http://www.ncbi.nlm.nih.gov/genome/22419). The Xenopus laevis L and S genomes were analyzed from the Xenbase database (www.xenbase.org). Additional file 1 demonstrates all the species that were used in each analysis. Additional file 2 shows the databases that were used to extract the peptide sequences of all the investigated species. The following actinopterygian transcriptomes were retrieved and investigated from the Phylofish database (http://phylofish.sigenae.org/index.html): bowfin, Amia calva; spotted gar, Lepisosteus oculatus; elephantnose fish, Gnathonemus petersi; arowana, Osteoglossum bicirrhosum; butterfly fish, Pantodon buchholzi; European eel, Anguilla anguilla; rainbow trout, Oncorhynchus mykiss; allis shad, Alosa alosa; zebrafish, Danio rerio; panga, Pangasius hypophthalmus; northern pike, Esox lucius; grayling, Thymallus thymallus; Atlantic cod, Gadhus morua; medaka, Oryzias latipes; European perch, Perca fluviatilis; brown trout, Salmo trutta; European whitefish, Coregonus lavaretus; brook trout, Salvelinus fontinalis; Astyanax, Astyanax mexicanus; lake whitefish, Coregonus clupeaformis; eastern mudminnow, Umbra pygmae; and sweetfish, Plecoglossus altivelis. The peptidic sequences of zebrafish Npm2a and Npm2b were used as query in TBLASTN search to identify the open reading frame (ORF) encoding npm2 genes in the various investigated genomes and transcriptomes. We also used sequences from human npm2b and Xenopus npm2 genes to confirm the obtained sequences. Genomic data were analyzed using the TBLASTN algorithm (search sensitivity: near exact match short) on the ENSEMBL website or the NCBI browser as indicated in Additional file 2. The TBLASTN algorithm on the SIGENAE platform was used on the transcriptomic data. Amino acid sequences of 75 Npm2, 3 Npm3, and 3 Npm1 proteins were first aligned using ClustalW. The JTT (Jones, Taylor, and Thornton) protein substitution matrix of the resulting alignments was determined using ProTest software. Phylogenetic analysis of Npm proteins was performed using the Maximum Likelihood method (MEGA 5.1 software) with 1000 bootstrap replicates. Synteny maps of the conserved genomic regions in human, mouse, chicken, Xenopus, coelacanth, spotted gar, zebrafish, and tetraodon were produced using PhyloView on the Genomicus v75.01 website (http://www.genomicus.biologie.ens.fr/genomicus-75.01/cgi-bin/search.pl). Synteny analysis of the Chinese alligator conserved genomic regions was performed using TBLASTN searches in the corresponding genomic database. For each gene, the peptidic sequences of human and chicken were used as query, as far as they were referenced in the databases. RNA-seq data were deposited into Sequence Read Archive (SRA) of NCBI under accession references SRP044781–84, SRP045138, SRP045098–103, and SRP045140–146. The construction of sequencing libraries, data capture and processing, sequence assembly, mapping, and interpretation of read counts were all performed as previously reported . We datamined the Phylofish online database to retrieve the tissue localization data for npm2a and npm2b. For each sample, total RNA was extracted using Tri-Reagent (Molecular Research Center, Cincinnati, OH) according to the manufacturer’s instructions. Reverse transcription (RT) was performed using 1 μg of RNA from each sample as previously described . Various tissues were harvested from wildtype (WT) zebrafish (N = 3), obtained from the INRA LPGP fish facility, and Xenopus (N = 3), obtained from the Institut de Génétique et Développement de Rennes, Université de Rennes 1 animal facility (Rennes, France). cDNA originating from the tissues of the individual fish was used as individual biological replicates while that from Xenopus was pooled and subsequently used for qPCR. Follicular oocytes at different stages of oogenesis were obtained from 3 to 4 different WT animals. The functional analyses were performed with individual clutches containing 50–200 embryos that were harvested and pooled from each npm2a (N = 4) and npm2b (N = 5) mutant female. qPCR experiments were performed on at least 3 clutches from each individual mutant, where each clutch represented a biological replicate, using the Fast-SYBR GREEN fluorophore kit (Applied Biosystems, Foster City, CA) with 200 nM of each primer in order to keep PCR efficiency between 90 and 100%, and an Applied Biosystems StepOne Plus instrument as per the manufacturer’s instructions. RT products, including control reactions, were diluted 1/25, and 4 μl of each sample were used for each PCR. All qPCR experiments were performed in triplicate. The relative abundance of target cDNA was calculated from a standard curve of serially diluted pooled cDNA and normalized to 18S, β-actin, β2-microglobulin, and ef1α transcripts. The primer sequences can be found in Additional file 3. Fish used in this study were reared and handled in strict accordance with French and European policies and guidelines of the INRA LPGP Institutional Animal Care and Use Committee, which approved this study. CRISPR/cas9 guide RNAs (gRNAs) were designed using the ZiFiT online software and were made against 3 targets within each gene to generate large genomic deletions, ranging from 250 to 1600 base pairs, that removed several exons which rendered the Npm2 proteins non-functional. Nucleotide sequences containing the gRNA were ordered, annealed together, and cloned into the DR274 plasmid. In vitro transcription of the gRNA from the T7 initiation site was performed using the Maxiscript T7 kit (Applied Biosystems), and their purity and integrity were assessed using the Agilent RNA 6000 Nano Assay kit and 2100 Bioanalyzer (Agilent Technologies, Santa Clara, CA). Zebrafish embryos at the one-cell stage were micro-injected with approximately 30–40 pg of each CRISPR/cas9 guide along with 8–9 nM of purified cas9 protein (a generous gift from Dr. Anne de Cian from the National Museum of Natural History in Paris, France). The embryos were allowed to grow to adulthood, and genotyped using fin clip and PCR that detected the deleted regions. The PCR products of the mutants were then sent for sequencing to verify the deletion. Once confirmed, the mutant females were mated with WT males to produce F1 embryos, whose phenotypes were subsequently recorded. Images were captured with a Nikon AZ100 microscope and DS-Ri1 camera (Tokyo, Japan). Fin clips were harvested from animals under anesthesia (0.1% phenoxyethanol) and lysed with 5% chelex containing 100 μg of proteinase K at 55 °C for 2 h and then 99 °C for 10 min. The extracted DNA was subjected to PCR using Advantage2 system (Clontech, Mountain View, CA) for npm2b and Jumpstart Taq polymerase (Sigma-Aldrich, St. Louis, MO) for npm2a. The primers are listed in Additional file 3. Ovaries from age-matched WT (N = 3), and npm2a- (N = 3) and npm2b-mutant (N = 3) females were harvested, fixed in 4% paraformaldehyde, and embedded in paraffin. Then, at least 5 sections were cut at 7 μm thickness from 5 different areas of the ovary from each animal, and the slides were stained with Regaud’s hematoxylin. Images were captured using a Nikon Eclipse microscope and camera set. The number and size of the CGs as well as total area of all the stage II follicles (according to Kimmel et al. and Selman et al. ) in all the slides were quantitated using ImageJ software (National Institute of Health). Comparison of two groups was performed using the GraphPad Prism statistical software (La Jolla, CA), and either the Student’s t-test or Mann-Whitney U-test was conducted depending on the normality of the groups based on the Anderson-Darling test. As previously shown, npm1, npm2, npm3 and npm4 genes are thought to have originated from the first two rounds of whole genome duplication (WGD) in the ancestral vertebrate (VGD1 and VGD2), which occurred early on in vertebrate evolution [14–17]. However, two npm2 genes have been automatically annotated in the zebrafish genome, i.e. npm2a and npm2b.We set out to investigate the evolutionary history and function of the newly annotated npm2a gene and compare it with its homolog, npm2b. In order to verify if these two npm2 genes are paralogous to each other and to determine their origin, we used a Blast search approach in various public databases to retrieve 91 sequences that could be related to npm2 genes. We used sequences from evolutionarily diverse species such as zebrafish and Xenopus npm2 genes as well as human npm2b to ascertain that all paralogs from more distantly related species were obtained. All retrieved sequences are compiled in Additional file 2. In order to verify that the retrieved protein sequences (Additional file 2) are homologous to zebrafish Npm2a and Npm2b, a phylogenetic analysis on Npm2 was performed. Based on the alignment of 77 vertebrate Npm2-related sequences, and using vertebrate Npm1 and Npm3 amino acid sequences as out-groups, a phylogenetic tree was generated (Fig. 1). We found that species from various vertebrate groups, including chondrichthyans (such as dogfish), ray-finned fish, lobe-finned fish, amphibians, as well as sauropsids contained both Npm2a and Npm2b sequences. However, no Npm2a sequence was identified in mammals, including human, pig, cow, panda, guinea pig, mouse, rat, and opossum although they all harbor Npm2b. These results demonstrated, for the first time, that proteins previously reported as Npm2 (Xenopus, cattle, mouse, human, zebrafish) are orthologous to Npm2b in all investigated vertebrate species, and should therefore now be referred to as Npm2b. Further, neither Npm2a nor Npm2b sequences were found in neoteleosteans including medaka, European perch, Atlantic cod, and tetraodon as well as in lampreys. In contrast, our analysis demonstrated the existence of two paralogous Npm2b proteins (i.e. Npm2b1 and Npm2b2) in all of the investigated salmonid species (rainbow trout, brown trout, and brook trout). 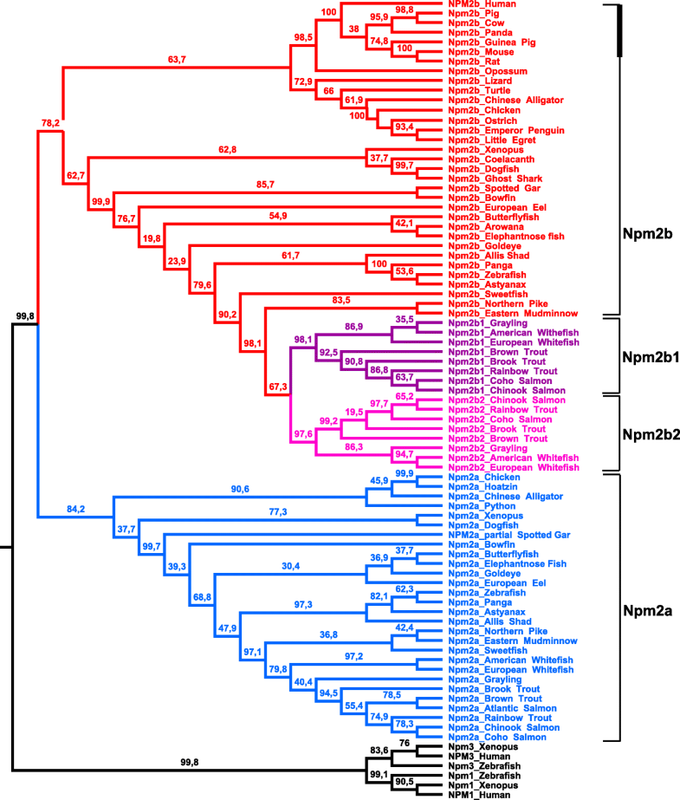 The existence of the two Npm2 clades indicated that Npm2a and Npm2b are likely paralogous to each other. In addition, comparison of Npm2a and Npm2b amino acid sequences in the species that harbor both revealed that they share between 30.2% and 46.4% homology, depending on the species (Additional file 4). The low sequence identity is consistent with an ancient duplication event that gave rise to npm2a and npm2b genes. However, neither the topology of the Npm2 phylogenetic tree nor the comparison between Npm2a and Npm2b could indicate the kind of duplication event that had occurred. In contrast, the high sequence identity shared by Npm2b1 and Npm2b2 in salmonids (between 75.1% and 86%) suggested a more recent duplication event. This observation in all of the investigated salmonid species is consistent with the hypothesis that npm2b1 and npm2b2 genes likely resulted from the SaGD. In order to further understand the origin of the npm2a and npm2b genes in vertebrates, we performed a synteny analysis of their neighboring genes in representative vertebrate genomes. We focused our study on two mammals (human and mouse), two sauropsids (Chinese alligator and chicken), two amphibians (Xenopus tropicalis and laevis L), one basal sarcopterygian (coelacanth), one basal actinopterygian (spotted gar), and two teleosts (zebrafish and tetraodon) (Fig. 2). Analysis was also performed on the Xenopus laevis S subgenome, but since the results were very similar to that of Xenopus laevis L subgenome, we only showed the latter’s data . 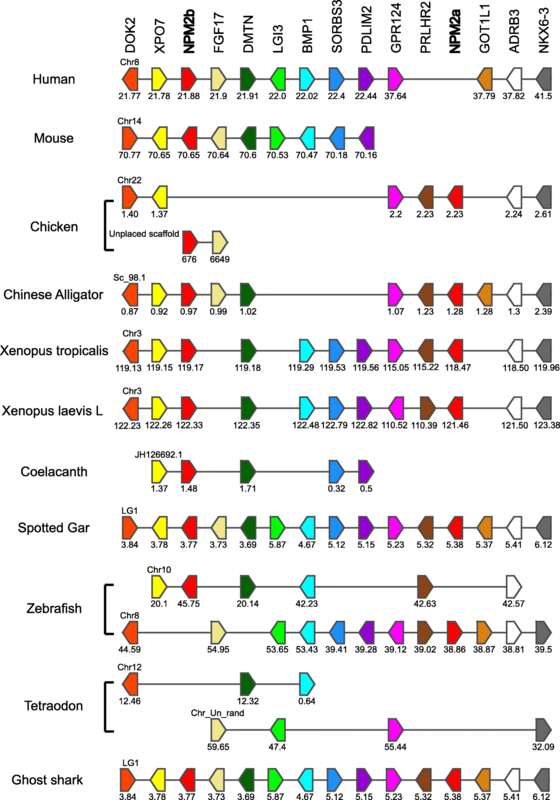 The human, mouse, Chinese alligator, Xenopus tropicalis and laevis, coelacanth, spotted gar, and zebrafish npm2b genes are located in genomic regions containing common loci, including dok2, xpo7, fgf17, dmtn, lgi3, bmp1, sorbs3, pdlim2, gpr124, prlhr, got1l1, adrb3, and nkx6–3. Together with the phylogenetic analysis, this indicated that npm2b genes investigated here are orthologous. Synteny analysis confirmed the absence of the npm2b gene in tetraodon although the above-mentioned neighboring genes are present in its genome (Fig. 2 and Additional file 5). The Chinese alligator, chicken, Xenopus tropicalis and laevis, spotted gar, and zebrafish npm2a genes are located in genomic regions containing the same loci as npm2b conserved regions (Fig. 2). Indeed, Chinese alligator and spotted gar npm2a and npm2b genes are located in the vicinity of each other on scaffold 98.1 and the linkage group LG1, respectively. The presence of npm2a and npm2b genes in the same genomic region in representative species of sarcopterygians (Chinese alligator and Xenopus tropicalis and laevis) and actinopterygians (spotted gar) strongly suggested that npm2a and npm2b genes could have resulted from a unique local duplication of an ancestral npm2 gene. The presence/absence of npm2a and npm2b in the current vertebrate phyla and species is summarized in Fig. 3, and we also propose an evolutionary scenario for the diversification of the npm2 genes across vertebrate evolution. In this study, we demonstrated that npm2a and npm2b may be paralogous genes present in the different vertebrate groups, chondrichthyans (Fig. 1), sarcopterygians, and actinopterygians (Figs. 1 and 2), which strongly suggested that the npm2 genes originated from a duplication event prior to the divergence of chondrichthyans and osteichthyans. Since the four npm family members (npm1, npm2, npm3, and npm4) are thought to be produced from the first two rounds of WGD (VGD1 & VGD2) that occurred early on in vertebrate evolution, we can thus hypothesize that the duplication event that generated npm2a and npm2b took place after VGD2, but before emergence of chondrichthyans and osteichthyans, between 450 and 500 million years ago (Mya) . The findings from our synteny analysis demonstrated that in representative species of actinopterygians (spotted gar) and sarcopterygians (Xenopus tropicalis and laevis and Chinese alligator), npm2a and npm2b genes are at two distinct loci located on the same chromosomic region (Fig. 2). These results strongly suggested that npm2a and npm2b genes arose from local gene duplication rather than a whole genome (or chromosome) duplication event (Fig. 3). The teleost ancestor experienced an extra WGD event (TGD) , but in all investigated teleosts, we observed a maximum of one npm2a ortholog and one npm2b ortholog (except in salmonids) (Fig. 1). In addition, npm2a and npm2b are located on two TGD ohnologous regions on chromosomes 8 and 10, respectively (Fig. 2), in zebrafish, which is consistent with the loss of one of the npm2a duplicates from one region and the loss of one npm2b duplicate from the corresponding ohnologous region. Thus, npm2 evolution is most likely due to the early loss of one of the two npm2a and npm2b TGD ohnologs. This observation in zebrafish strengthened the hypothesis that TGD did not impact the npm2a and npm2b evolution in teleosts. In addition, the lack of npm2a and npm2b in neoteleostei species, such as tetraodon, suggested that additional gene losses occurred early in the evolutionary history of this group (Fig. 2). In salmonids, we identified two npm2b paralogs, i.e. npm2b1 and npm2b2, in all investigated salmonid species (Fig. 1). Considering the high amino acid sequence identity shared by Npm2b1 and Npm2b2 (between 75.1% and 86%), it is strongly hypothesized that these duplicates originated from SaGD. In contrast, we identified only one npm2a gene in all investigated salmonids suggesting that SaGD did not impact the current salmonid npm2a evolution most likely due to early loss of the SaGD ohnolog of this gene (Fig. 3). In addition to the early gene losses after WGD, various other independent and phylum-specific gene losses may have contributed to shape the current npm2a and npm2b genes in vertebrates. In fact, although both npm2a and npm2b have been globally conserved in sarcopterygians and actinopterygians, some phyla in each group lack at least one of the genes. In sarcopterygians, npm2a is conserved in amphibians such as Xenopus tropicalis and laevis, and in sauropsids such as Chinese alligator and chicken (Figs. 1, 2, 3). In contrast, we did not find any npm2a genes in the Coelacanth genome (Figs. 1, 2, 3), which could be due to the lower assembly quality of the concerned genomic region (see Additional file 5), and in the mammalian genomes including human and mouse (Figs. 1, 2, 3), whose absence may have been due to the loss of this gene in the common ancestor of mammals. Further, neither gene was found in lampreys which suggests early loss of the ancestral gene in this group. Thus, our data suggest that nmp2a was retained in vertebrates with late (i.e. mid-blastula) ZGA such as fish and amphibians, while it was lost in mammals that have early (i.e. 1–3 embryonic divisions) ZGA . Considering the essentialness of the npm2 gene in embryonic development, its lack in some neoteleostean species, such as Atlantic cod and medaka, raises the question on how evolution can cope with its loss. Further analyses of data from the Phylofish database  (data not shown) showed that npm3 had the strongest homology to npm2 and was predominantly expressed in the ovaries in medaka and cod which suggest that it could potentially compensate for npm2 deficiency. In contrast, npm3 does not show an ovarian-predominant expression in spotted gar and zebrafish, thus suggesting that its strong ovarian expression could be restricted to neoteleostei. To gain insight into the functional role of Npm2a, we examined its protein domains in comparison with Npm2b since to date, only the role of Npm2b has been investigated, such as in Xenopus tropicalis [9, 28, 29], mouse [11, 30], humans [31–33], cattle , and zebrafish . However, no data is available on the structure and function of Npm2a. The nucleoplasmin family is defined by the presence of an Npm core domain, which enables oligomerization of Npm proteins, in all of its members [35, 36]. We were able to predict the presence of this domain in all investigated Npm2a and Npm2b sequences (Additional file 6), suggesting that Npm2a proteins could also form homo- or hetero-polymers. Acidic tract domains are also features of nucleoplasmin proteins and were demonstrated to facilitate histone binding by increasing the recognition and affinity for different histones [37, 38]. Acidic tract A1 was demonstrated to be absent from most of the Npm2b investigated so far, except Xenopus tropicalis Npm2b, and acidic tract A2 was predicted to be in all investigated Npm2b apart from guinea pig Npm2b and American whitefish Npm2b1 (Additional file 6). This strongly suggested that the histone and basic protein binding activity of Npm2b is mediated predominantly by acidic tract A2. On the other hand, in all investigated Npm2a proteins, we predicted an acidic tract A1 except in that of dogfish, zebrafish, and allis shad (Additional file 6). In contrast, only half of the investigated Npm2a proteins harbored an acidic tract A2, which is additionally shorter than the one present in Npm2b proteins (Additional file 6). Our results demonstrated that most investigated Npm2a proteins possess acidic tracts that could potentially mediate histone and basic protein interactions, and that are different than those found in Npm2b which suggest that these two proteins may have diverse functions. As previously demonstrated, npm2b functions as a histone chaperone to decondense sperm DNA as well as reorganize chromatin, thus, it has also been suggested to contribute to ZGA as well. [5, 11, 34, 39] Npm2b is thought to be activated by various post-translational modifications and homo-pentamerisation , and subsequently interacts with chromatin by exchanging sperm-specific basic proteins with histones via its core domain and acidic tracts A1, A2 and A3 [32, 36, 38, 41–44]. We found that most of the investigated Npm2a proteins possess acidic tract A1 while some have a shortened A2, in contrast to Npm2b proteins which have a long A2 and mostly lack A1. Thus, Npm2a is likely capable of mediating histone and basic protein interactions like the other nucleoplasmins, although its function may be different than that of Npm2b. In order to investigate further the potential functions of Npm2a and Npm2b, we explored the tissue distributions of both transcripts using two different approaches, qPCR and RNA-seq, the latter of which was obtained from the Phylofish online database . In zebrafish and Xenopus tropicalis, we observed by qPCR that npm2a and npm2b were both predominantly expressed in the ovary, and to a lesser extent, the muscle, as well as in the zebrafish gills (Fig. 4a and b). 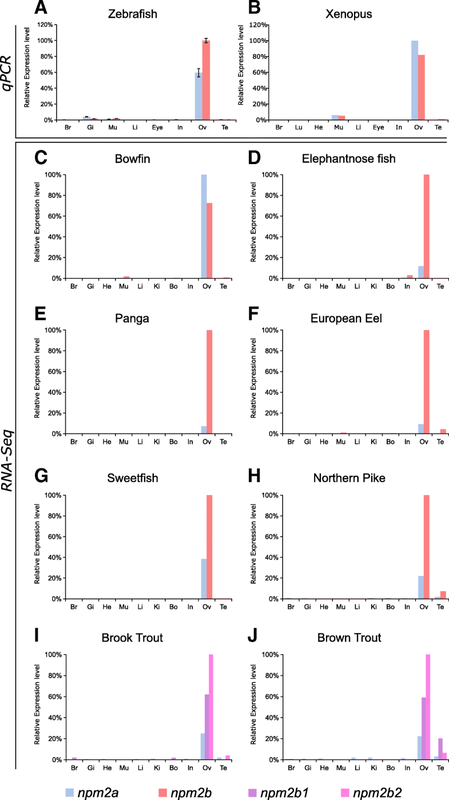 We also demonstrated via the Phylofish database that npm2a and npm2b were predominantly expressed in the ovary of bowfin, elephantnose fish, panga, European eel, sweetfish, and northern pike (Fig. 4c to h). In the investigated salmonid species, brook trout and brown trout, npm2a, npm2b1, and npm2b2 were also predominantly expressed in the ovary (Fig. 4i and j). In addition, npm2 transcripts were expressed at a very low level in the testis of European eel, northern pike, and salmonid species (Fig. 4f, h, i, and j). In teleosts, npm2a mRNA levels globally tended to be lower than npm2b (or npm2b1 and npm2b2 for salmonids) (Fig. 4a and d-j). In order to delve deeper into their functions in reproduction and embryogenesis, we investigated npm2a and npm2b mRNA expression during oogenesis and early development in zebrafish. 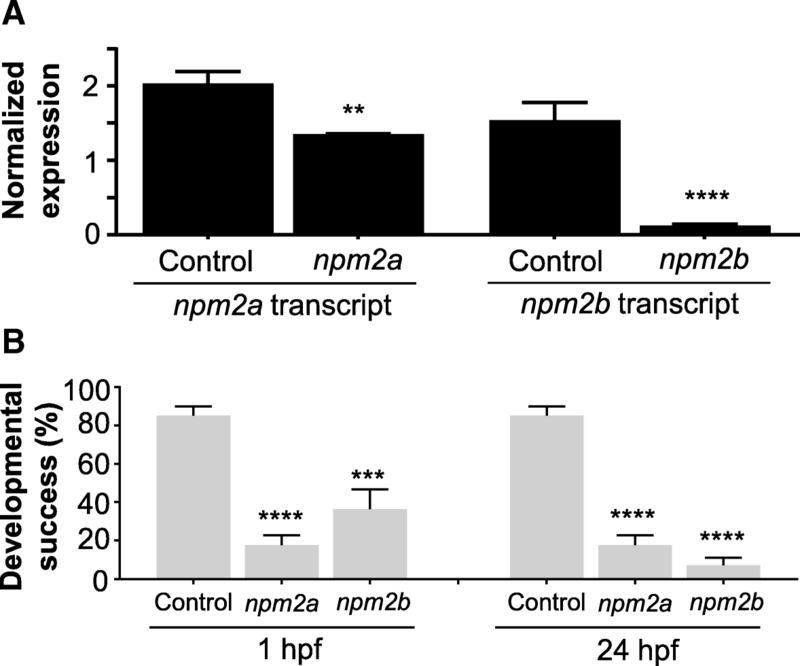 During zebrafish oogenesis, both npm2a and npm2b transcripts were found at high levels in oocytes (Fig. 5a), and despite gradual decreases in the levels of both npm2 during oogenesis, they still can be detected at reasonable amounts in the unfertilized egg (i.e. metaphase 2 oocyte) (Fig. 5b). Thereafter, npm2a and npm2b transcript levels progressively decreased during embryonic development after fertilization with a substantial reduction after MBT (around 4 hpf) before reaching very low levels at 24 h post-fertilization (hpf) (Fig. 5b). Our findings demonstrated clear ovarian-specific expression profiles of npm2a and npm2b transcripts that were conserved in all investigated species, from teleosts to tetrapods, which suggested that they both have roles in female reproduction and/or embryonic development. This is consistent with the npm2b mRNA profiles reported in the literature for mouse , cattle , Xenopus tropicalis , and zebrafish . Further, we found that the npm2 transcripts were highly abundant from early oogenesis through to early embryogenesis, finally being degraded at around MBT, which suggested that both mRNAs are strictly maternal (i.e. not re-expressed by the zygote), consistent with previous studies on zebrafish npm2a and npm2b transcripts [5, 45]. Their expression profiles are typical features of maternally-inherited mRNAs, which highly suggested that the newly described npm2a is also a maternal-effect gene as well. To understand the roles of these two npm2 proteins during oogenesis and early embryogenesis, we performed functional analysis of these two Npm2 proteins by genetic knockout using the CRISPR/cas9 system. One-cell staged embryos were injected with the CRISPR/cas9 guides that targeted either npm2a or npm2b and allowed to grow to adulthood. Since the mutagenesis efficiency of the CRISPR/cas9 system was very high, as previously described [46, 47], the npm2 genes were sufficiently knocked-out even in the mutant mosaic F0 females. This was evidenced by the substantially lower transcript levels of npm2a and npm2b in the F1 embryos as compared to those from control WT pairings (Fig. 6a). Thus, the phenotypes of npm2a (n = 4) and npm2b (n = 5) mutants could be observed even in the F0 generation. Since none of the mutated genes were transmissible to future generations neither through the male nor the female (ie. all the surviving embryos were WT), therefore, all of our observations were obtained from the F0 generation. We observed that most of the embryos from both npm2a and npm2b mutant females had a very low developmental success even at a very early stage of growth (1 hpf) (17.6 ± 5.1% and 36.4 ± 10.2%, respectively, vs. 85.1 ± 4.9% in controls) (Fig. 6b) as defined by a complete lack of cell division (non-cellularized). Table 1 demonstrates the penetrance of the npm2a and npm2b mutant phenotypes in single spawns from individual mutants. Relative to the controls (Fig. 7a-d), the npm2a mutant females produced non-developing eggs with two phenotypes; those with normal morphology (Fig. 7e-h), and a large population with an abnormal morphology (Fig. 7i-l), which included smaller egg, enlarged yolk, and not fully expanded chorion membrane (36.4 ± 6.9% vs. 0% in controls). The diameter of the egg is demonstrated by the red dotted lines, which reveal the extremely reduced size of some of the npm2a embryos (Fig. 7b, c, j, k). The eggs derived from npm2a mutant females that did not undergo any cell division at 1 hpf continued to display a complete lack of development up to 8 hpf. 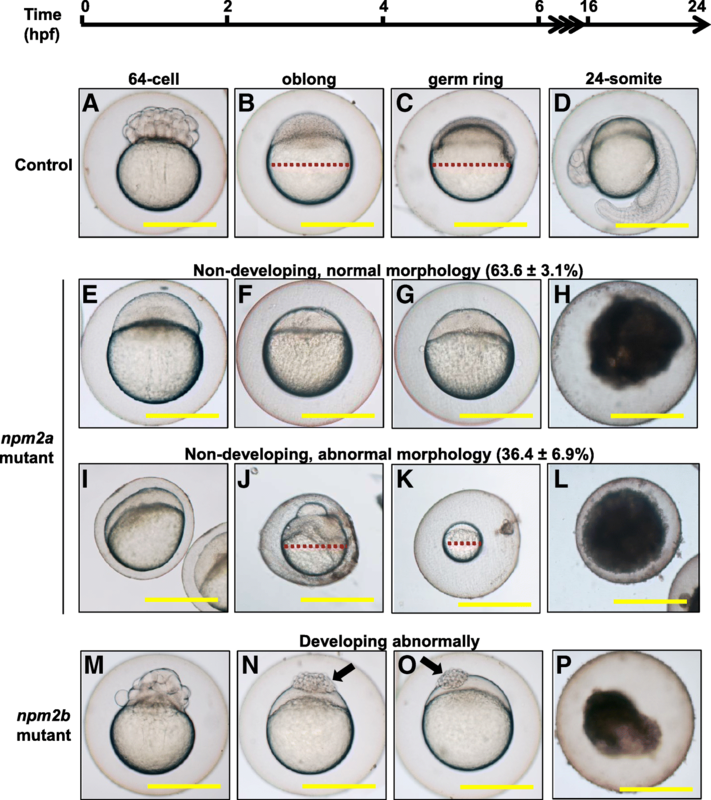 By 24 hpf, the non-developing eggs of both phenotypes from npm2a mutant females that failed to divide were all dead while the remaining embryos that showed normal development and cell division continued to progress normally. The observed phenotype of the non-cellularized npm2a embryos was very similar to previously described unfertilized eggs . These novel findings showed for the first time that npm2a is essential for the developmental competence of zebrafish eggs, and is therefore a crucial maternal-effect gene. In addition to the eggs that never developed past the one-cell stage, a significant number of the npm2b-derived eggs (29.2 ± 7.3% vs. 0% in controls) showed abnormal cell division that culminated in developmental arrest at around 4 hpf or the MBT following which the cells stopped dividing and appeared to regress (Fig. 7m-p). These eggs had a partially cellularized blastodisc that was sitting atop an enlarged yolk syncytial layer that became larger with time (arrows in Fig. 7n and o). By 24 hpf, these embryos were all dead while the remaining embryos that showed normal development and cell division continued to progress normally (7.2 ± 3.9% vs. 85.1 ± 4.9% in controls). Our findings demonstrated that npm2a deficiency leads to a phenotype of decreased egg competence at the earliest stage whereby most of the spawned eggs failed to undergo cell division and subsequently died. Eggs that were deficient in npm2b also showed lack of development beyond the one-cell stage, but a proportion of these eggs were able to overcome this deficiency possibly due to residual expression of npm2b or compensation by other molecules, and these eggs were fertilized and underwent several cell divisions before arresting and eventually dying. This latter phenotype corroborated with that described in a previous study which demonstrated that fertilized eggs injected with morpholinos against npm2b were arrested at around MBT and eventually died . Our novel results therefore suggested that npm2a functions predominantly during early oogenesis; its deficiency is completely incompatible with development and cannot be compensated by other molecules. On the other hand, npm2b plays a nonessential role during early oogenesis and early development, and its primary function is likely during MBT as previously described. In order to further characterize the phenotypes of these mutants, histological analyses of their ovaries were performed. We found that there were distinct differences in the appearance of stage II follicles (140–340 μm in diameter) [23, 24]. In particular, there was a drastic increase in number and reduction in size of the cortical alveoli or granules (CGs) in the stage II follicles of both npm2 mutants compared with those in the wildtype controls (Fig. 8a). There was a substantial progressive increase in number of CGs from wildtype controls (0.0026 ± 0.0002 CGs/μm2; p-value< 0.0001, npm2a and npm2b) to npm2b mutant follicles (0.0065 ± 0.0002 CGs/μm2; p-value = 0.0002, npm2a) to npm2a mutant follicles (0.0079 ± 0.0003 CGs/μm2) after adjusting to the total area of the follicle that was investigated (Fig. 8b). There was also a progressive decrease in the size of CGs from wildtype controls 0.0073 ± 0.0006 μm; p-value< 0.0001, npm2a and npm2b) to npm2b mutant follicles (0.0037 ± 0.0002 μm; p-value< 0.0001, npm2a) to npm2a mutant follicles (0.0025 ± 0.0002 μm). Only stage II follicles were quantitated, and the total areas of the follicles were comparable and not significantly different between all three groups (WT = 28,534 ± 2223 μm2, npm2a = 25,968 ± 1795 μm2, npm2b = 25,605 ± 2643 μm2) (Fig. 8c). Thus, our findings suggest that both npm2a and npm2b have roles in cortical granule function which may impact egg activation and fertilization. The histological analyses of the ovaries of the mutant females demonstrated that there were significant structural perturbations in the npm2a- and npm2b-deficient follicles during early oogenesis that may negatively impact egg competence. Our analyses showed that there was a dramatic decrease in size and increase in number in CGs in stage II follicles of the npm2a mutants while there was a similar although not as striking difference in the npm2b mutants. Along with the results in Fig. 5 that showed very high levels of npm2a and npm2b expression from the earliest stage of oogenesis (stage I), our data suggest that these two genes may have important functions in the production and/or growth of CGs during early folliculogenesis. A previous study showed that the souffle/spastizin gene regulates secretory vesicle maturation such that a mutation in this gene resulted in accumulation of immature CGs and a defect in egg activation . In addition, a mutation in the aura gene resulted in a decrease in CG exocytosis through its function in the reorganization of the cytoskeleton at fertilization . Further, mutations in the brom bones/hnrnpI gene also led to loss of the Ca2+ signal induced by fertilization, subsequently, CG exocytosis was also decreased . In these mutants, deficiency in CG maturity and exocytosis led to defects in egg activation, which was characterized by a decrease in cytoplasmic segregation and chorion membrane expansion, as well as in cell division, which exhibited as embryos with a cell mass atop an enlarged yolk syncytial region at the 1000-cell stage. Interestingly, we also observed dysfunctions in egg activation as the chorion membrane was not expanded fully in some of the eggs derived from npm2a mutant females (Fig. 7i, j, l), and the embryos from the npm2b females did demonstrate the same phenotype as the aura and brom bones/hnrnpI mutants corresponding to a defect in cell division (Fig. 7n and o). Thus, it seemed that the deformations in CGs in the npm2a stage II follicles led to a decrease in egg activation, and the npm2b mutants did not have a defect in egg activation, but in cell division. Here, we demonstrated that while npm2a and npm2b share similar tissue distribution, as both are found specifically in the ovaries and early stage embryos, their roles are distinct and essential, and one could not compensate for the other. Notably, our data suggest that npm2a may play a large role in CG function, which regulates egg activation. In contrast, npm2b appears to play a minor role in CG function and to function at a later stage (ie. MBT) since the npm2b-deficient embryos are capable of dividing until around 4 hpf, which corresponds MBT as previously reported [5, 11], and mainly showed defects in cell division. These findings are in line with those demonstrated for other maternal-effect genes in mammals, such as mater, floped, filia, tle6 , and bcas2  as well as in zebrafish, including fue  and cellular atoll , all of which function to moderate the early events of fertilization and embryogenesis and their ablation leads to arrest and mortality at the earliest stages of embryogenesis. Although the identification of maternal-effect genes and their functions is increasing, large gaps still remain as many maternal factors and regulatory mechanisms that contribute to the quality or developmental competence of the egg remain to be discovered. Our report describes clearly and in detail the evolutionary history, tissue distribution, as well as expression profile of the two npm2 genes, and provides new findings that demonstrate their in vivo functions that clearly indicate that npm2a is a newly described maternal-effect gene. These results will help us gain further insight into the evolution of maternal-effect genes especially in a diverse range of vertebrates (chondrichthyes, sarcopterygians, and actinopterygians). 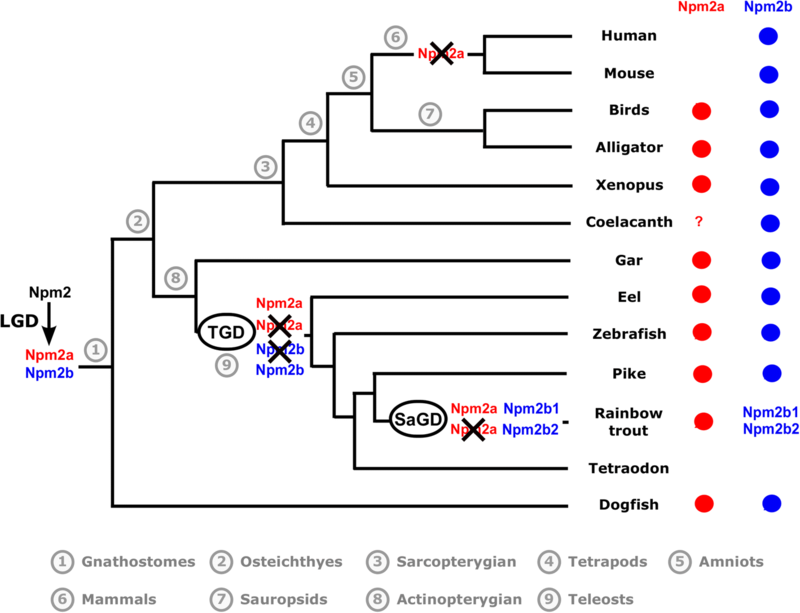 The evolutionary history of the npm2 genes indicated quite complex gene duplications and losses; an ancient gene duplication with subsequent loss of npm2a in mammals, and despite other WGD events, only one npm2a gene is retained in fish while npm2b was further duplicated during SaGD. It remains to be investigated whether the other copy of npm2b gene in salmonid is a pseudogene or not and if any other gene can functionally replace npm2a in mammals. Finally, our study will help us understand the underlying mechanisms that contribute to reproductive success, especially in terms of egg quality, in vertebrates. Authors would like to thank Dr. Yann Audic for providing Xenopus tropicalis samples and Ms. Amélie Patinote for zebrafish rearing and egg production. CTC performed gene knock-out, qPCR analysis, histology, and drafted the manuscript, JP and AB performed the phylogenetic analysis and participated in figure preparation and manuscript writing, TV and FC performed tissue sampling and qPCR analysis, YG participated in data analysis and manuscript writing, JB conceived the study and participated in data analysis and manuscript writing. All authors have read and approved the manuscript. This work was supported the French National Research Agency (ANR) under grant agreement ANR-13-BSV7–0015-Maternal Legacy to JB. The funding body had no role in the design of the study and collection, analysis, and interpretation of data and in writing the manuscript. All data generated and/or analyzed during this study are included in this published article [and its supplementary information files]. All procedures involving animal experiments and sample collection were in accordance with the guidelines set by the French and European regulations on animal welfare and the INRA LPGP Institutional Animal Care and Use Committee. Protocols were approved by the Rennes ethical committee for animal research (CREEA) of INRA under approval no. R2012-JB-01.